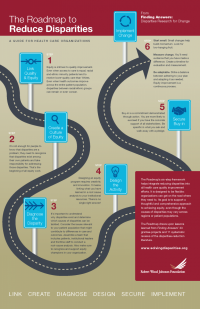 This guide gives you the materials to teach the Roadmap effectively and persuasively. It does not replace the Roadmap, so both you and your audience should read A Roadmap to Reduce Racial and Ethnic Disparities in Health Care before beginning this training series. This guide assumes that your audience will implement the Roadmap in clinical settings, such as practices and hospitals. However, you can tailor the training series for other interested groups. effectively address new or different disparities in the future.